Comfort, style, and a versatile design - what more could you want in a sectional sofa? This 2-piece leather sectional can easily remain the centerpiece of a room that changes over time alongside your personal style. 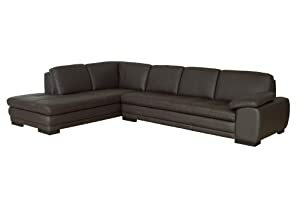 All the seating surfaces of the sectional are upholstered with rich brown genuine leather. Rest assured your new purchase is constructed with only the best materials - the frame is solid kiln-dried hardwood and the interior cushioning is made of high-density polyurethane foam. Further support is given by the built-in rubber webbing inner supports. Only light assembly is required - the wooden feet will need to be attached. This sectional is surely contemporary seating at its finest, and one of our most popular designs.